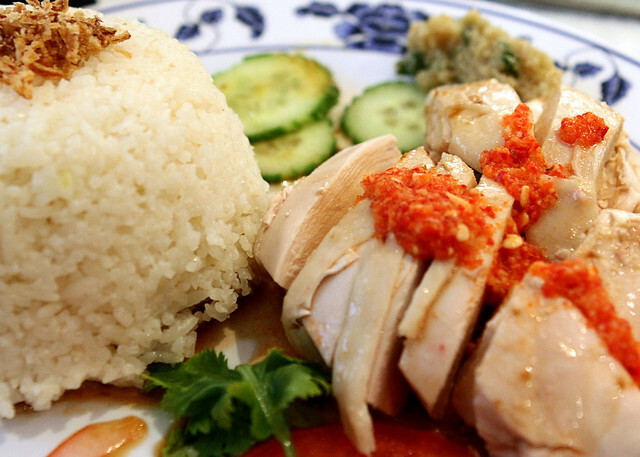 This is another must try when you are in Singapore, that is the Hainanese Chicken Rice. It promises you tender chicken after 2.5 hours of cooking using this special recipe and preparation. You need, 1 kg of chicken, ginger, onions for the stock. The chicken part of the meal will need 1.5kg of free range chicken. Mainly chicken but you need Shaoxing wine or Chinese cooking wine, light soy sauce, chopped garlic clove, ginger slices, chopped spring onions, sesame oil and salt. There other two other sauces to go along with this delicious chicken other than rice. Chilli sauce can be made with 10 long red chilli, garlic, ginger, lime juice & salt. While the ginger sauce with garlic, ginger, lime juice and salt. In the video at 7:06 shows this detail and you can really make a great condiment that really enhances this wonderful rice meal. Of course, the rice is no ordinary rice too. Using the reserved chicken fat, add grated ginger, finely chopped garlic cloves, pandan leaves, salt, and long-grain rice to prepare. The instructions are available in the following video recipe.